In this chapter Pinker is searching for evidence that man’s appreciation of art is innate, and therefore universal across cultures and grounded in the human brain’s prehistoric evolution. Immediately sounded to me like a description of the opening levels of an action adventure or RPG game. Could it be that the kind of settings and narratives in these games reverberate in human culture for the same reasons the McPainting images do? I could have deliberately picked an image from Ocarina of Time that was even more similar to the McPainting, but I think this image of Hyrule field has enough striking similarities for the sake of this examination. Both are predominantly blue and green. Green and blue were in the favourite top three colours chosen by each country polled in Komar and Melamid’s experiment. Both images contain relatively flat undulating landscapes, with distant features (if we were able to move the camera in the Zelda shot to the right we’d be able to see a nice picturesque mountain). Both have a heroic figure in the centre foreground, and if the Zelda image had one of the Hyrule Field monsters in it, we’d have our prerequisite hunt-worthy animal. 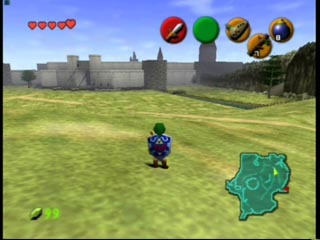 The early levels in Ocarina of Time also contain women and children (as do most starting environments in RPG’s). 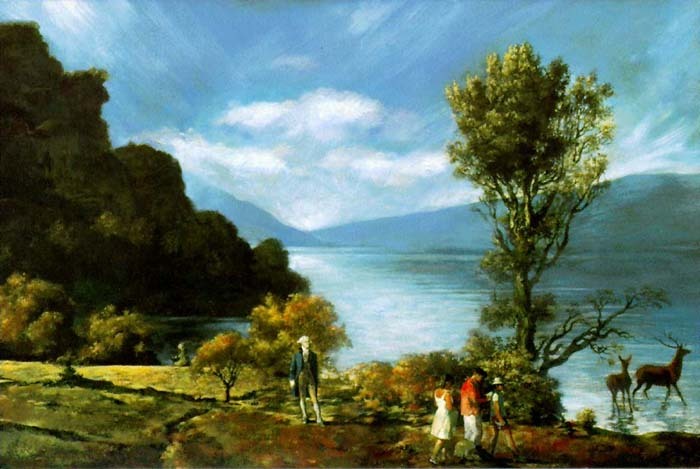 I’m not one to easily jump to conclusions, but it seems to me that the findings of Komar and Melamid can be applied to the creation of landscapes in videogames. If you want to create an idyllic environment to destroy and have the player seek to save, you could do a whole lot worse than examining the detail of their findings. If you are worried about making landscapes that appeal to a cross-section of international games players, then don’t because it seems we all have the same taste in natural beauty. Could it be that the relative lack of impact made by The Wind Waker and Beyond Good and Evil be related to their much less welcoming drowned worlds? This innate human appreciation for a certain, very specific type of landscape is part of the biologist E O Wilson’s ‘Biophilia’ hypothesis. He argues that the human mind evolved to appreciate landscapes and environments that gave our ancestors an advantage in the prehistoric plains of Africa. Archetypal biophilic scenes typically contain a wide view of the landscape (to keep an eye out for approaching predators and enemies), a body of water (for drinking and washing), trees (for fruit collection), animals (to hunt), and distant pathways and mountains (for the promise of exploration and further riches).